Bond yields are fixed; stock yields vary and sometimes vanish altogether. 2. Why Don't Bonds and Stocks Move Together? 3. Do Bonds Pay Dividend or Interest? 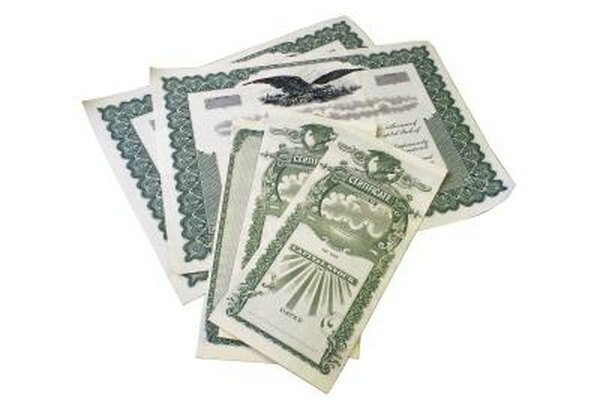 In the world of investments, "yield" means a stream of income -- the money you earn while holding stock shares or bonds. The market measures yield by percentage, somewhat like the interest rate you earn on your savings account down at the bank. But the nature of yield is quite different in bonds vs. stocks, and the difference is key in knowing what to expect from these investments. A corporate or municipal bond is a promise to pay a specific rate of interest on money you invest. A 5 percent bond, for example, pays you $50 in cash, every year, on a $1,000 investment until the bond matures, at which time you receive the bond's face value. But the market for bonds swings up and down with supply and demand. If the price of a bond rises then the yield will fall, as that $50 interest becomes a smaller percentage of the purchase price. You can trade a bond and make a profit on the price rise, but the purpose of a bond is a stream of reliable interest payments, not capital appreciation. Bonds always offer a yield, as they always pay interest unless the company or municipality is bankrupt. But a share of company stock has a yield only if it pays dividends. A dividend payment represents the company rewarding investors with a portion of its income. The yield on the stock is the dividend as a percentage of the stock price. Not all companies pay dividends; it is common for smaller and startup companies to withhold dividends until their businesses mature and their earnings rise. The yield on a stock rises and falls as its price and dividend amount vary. A dividend payout on stock is always optional, and a company can initiate, raise, lower or cancel its dividend, depending on the state of its finances. Very generally speaking, the higher the yield on either bonds or stocks, the higher the perceived risk in the investment. A relatively high bond yield means the company is not financially strong and is borrowing at a high rate of interest; A high stock yield means either that the company is paying out a lot of its cash or that its share price is falling, or both. Certain stock investments tend to have higher, steadier dividend yields. Utilities and banks, for example, usually pay good dividends. So do real estate investment trusts, which by law must distribute 90 percent of their taxable income to investors. Software and biotech companies are usually stingy with dividends, as they constantly plow their cash back into research and development. However, stockholders don't use dividend yield as their only measure of value; they also benefit from any rise in the share price. What Are the Dangers of Buying High-Dividend Stocks? Can the Dividend Ever Change on Preferred Stock? How Do Profits Reflect Stock Prices?